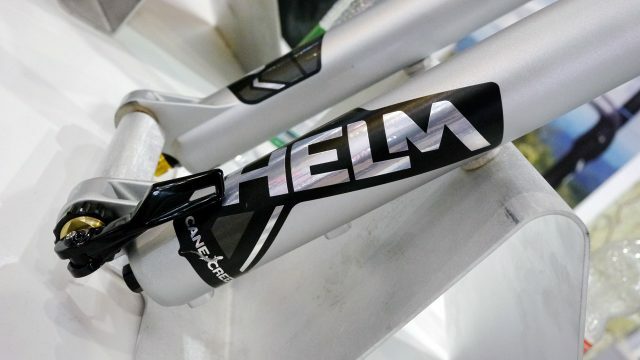 We’re currently testing the air version of the Helm, but heard Cane Creek would be showing a coil version for the first time here at Eurobike. We stopped by, and Jr. 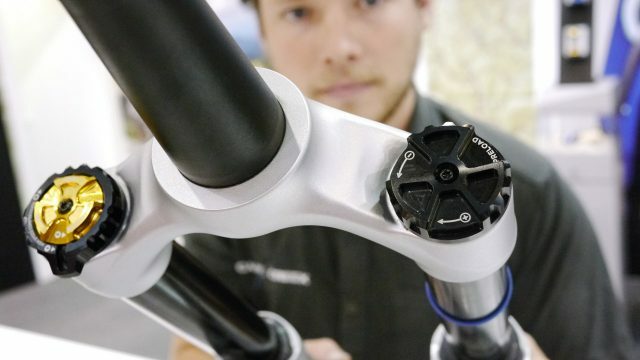 Product Manager Sam Anderson took us through it. 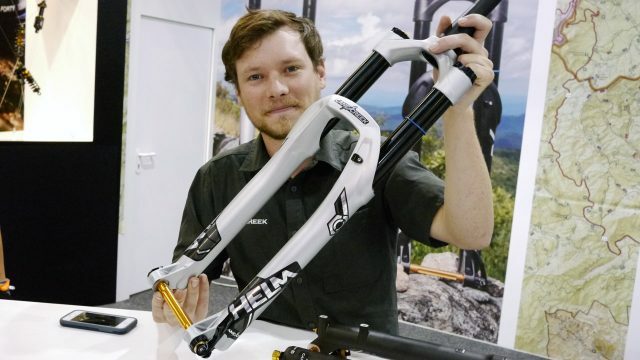 Previously the Helm has only launched in an air sprung version, but for 2018 there’s going to be a coil version in silver. 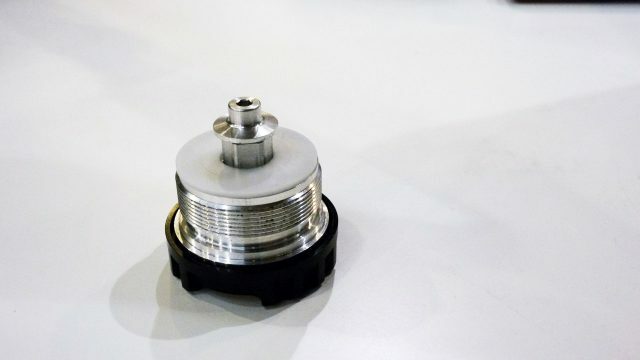 In the air version of the Helm, the left top cap has a tool free air-spring progressivity adjustment attached to this. Obviously that’s not the case for coil. Instead, it’s a preload cap with sixteen clicks of adjustment. Here are the gubbins from the coil spring side (notice those indexing grooves on the right?). 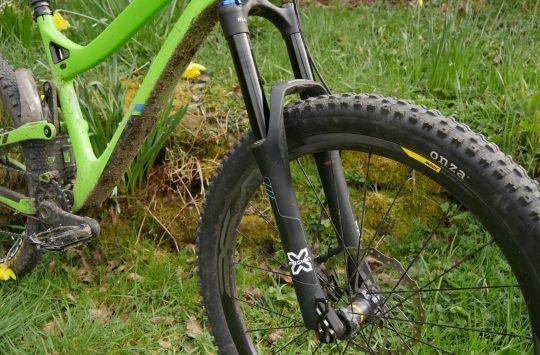 To get inside, you only need 13mm, 18mm and 22mm spanners; Cane Creek have intentionally made the fork easy to work on, with the express purpose that they want owners to be able to open it up easily without specialist tools. 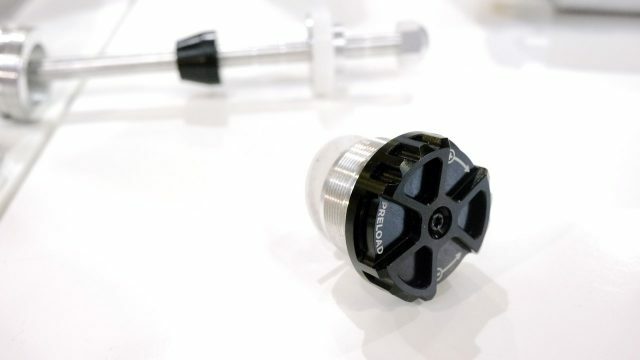 (As a side note here, we’ve performed a travel change on the air Helm we have in for testing, and it really is simple – one thing we particularly like is that you don’t have to drain the oil when you pull the uppers out. Leave the lowers facedown throughout the procedure, and they retain all of it. Here’s a video tutorial for the air version of the Helm). 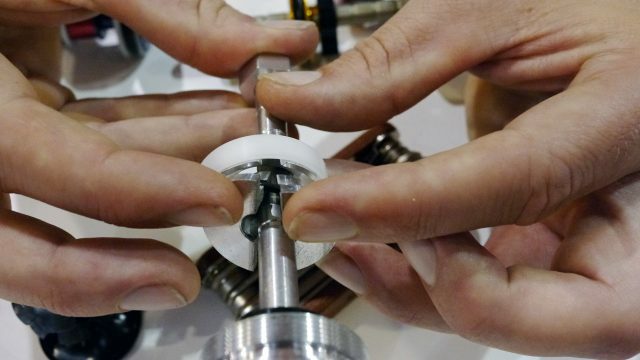 … then the two halves of the plunger underneath it are kept together by an o-ring. The indexing grooves are 10mm increments corresponding to travel ranging from 130mm to 160mm. For now, it’ll only be available in silver. Asked about the choice on the stand, they said they wanted it to not be black, nor be some kind of wild enduro orange or something, so picked silver as an uncommon but not too lairy finish. 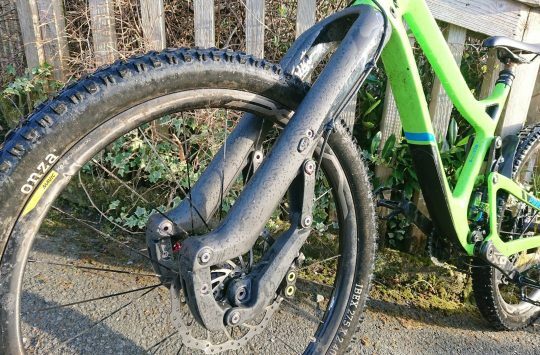 Cane Creek’s D-Loc axle system is pretty straightforward, and from experience we can tell you it’s solidly at the better end of the scale of axle systems and car park swearing. 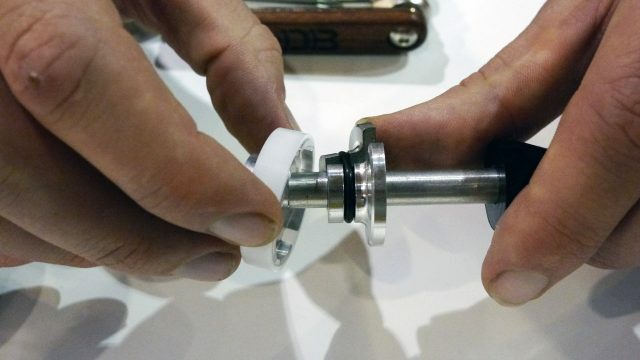 High and low speed compression settings on the right fork cap, and rebound at the bottom of the leg. Spring preload on the left. 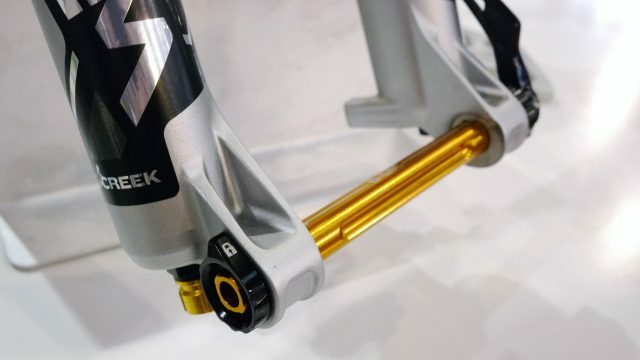 The Helm will ship with a 55lb spring as stock, which is aimed at riders weighing 72Kg to 86Kg. 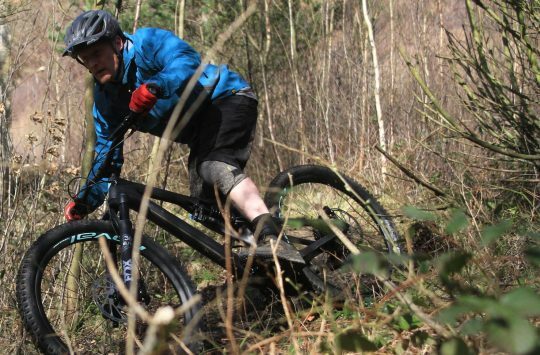 There will also be a light 45lb spring and a heavy 65lb spring for riders out of those ranges. 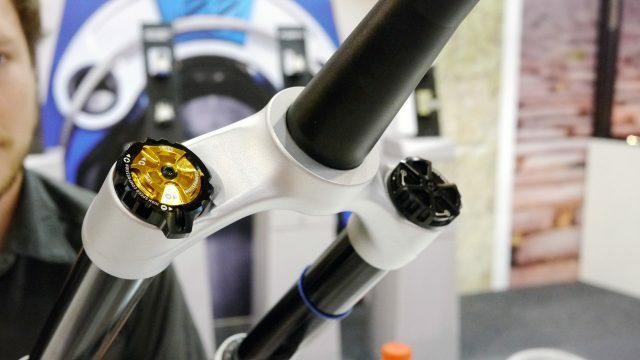 They say the coil version of the Helm is aimed at more aggressive riders, but that the lightest riders will probably be more suited to the air sprung Helm. 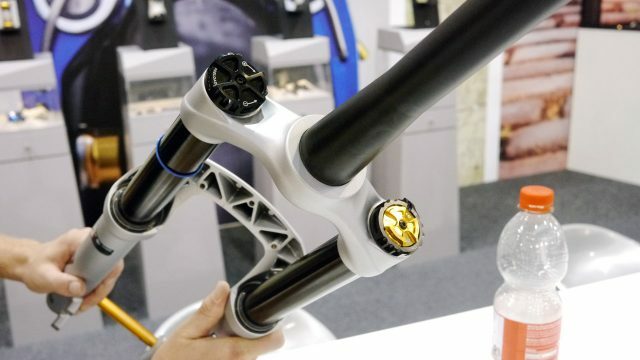 The Helm Coil will be available in November, and weights 2260g, which is only 190g heavier than the air version. UK RRP isn’t confirmed, though in the US the Helm Coil is the same as the air version at $1100. 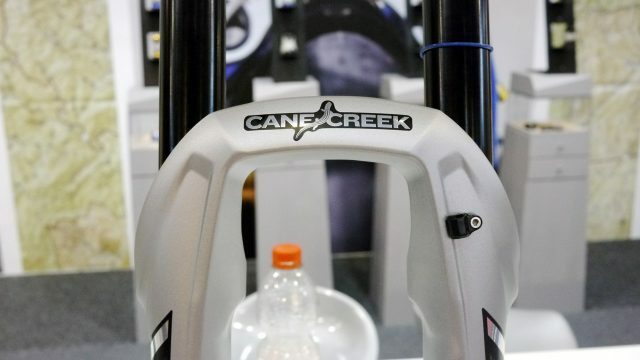 Cane Creek reps have said that in terms of the UK, that probably means a £950 RRP though may be subject to change. (No video? Try this link instead). 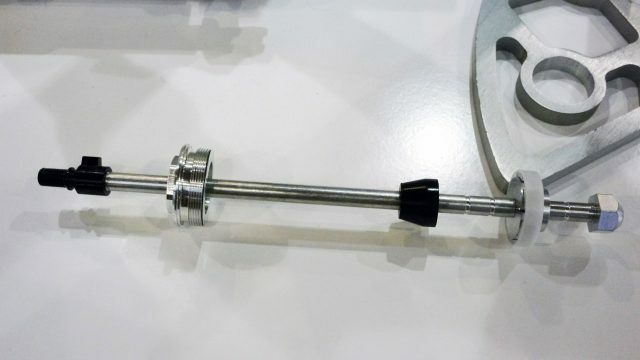 Great to see more and more coil options coming to market.